Order your Free Valve Catalog Today! 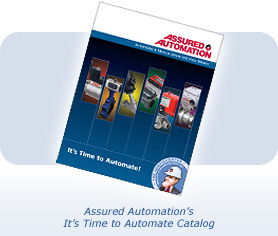 Assured Automation’s “It’s Time to Automate” catalog is a valuable resource when specifying fluid and gas applications in air drying, pollution control, process control, laundry equipment, textile dyeing & drying, bottling & dispensing equipment, ink & paint dispensing, industrial compressors, and others. Use our online valve configurator to quickly build automated valve assemblies, as you choose the components the model number, price, photo, and CAD drawings updates instantly. Check out our Configurator video. This entry was posted in Latest News and tagged 2-Way Ball Valves, Actuated Butterfly Valves, Automated Valves, Compact Automated Valves, Flow Meters, Free Catalog, Limit Switches, Manual Butterfly Valves, Manual Valves, Multi-Port Ball Valves, Plastic Valves, Request a Quote, Valve Accessories, Valve Actuators, Valve Configurator. Bookmark the permalink. Heyho there, just felt the urge to say how interesting this website is!